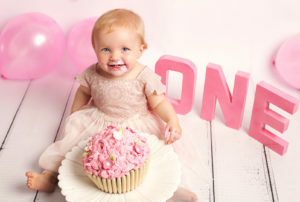 What better way to see in your little ones first Birthday by celebrating with a cake smash photoshoot. Lots of fun and memories to keep forever. Shoot time up to 1 hour in my studio, props, outfits and birthday cake included. Smart, clean shots in a smart outfit (outfit of your choice), shots with the Birthday cake and smash fun. **This fee does not include the cake, you can provide your own or why not add on £30 for a professionally made giant cupcake. Receive your beautiful images approx. two weeks after your shoot. **£50 non-refundable deposit taken at time of booking. Remaining balance due one week before the shoot.